Ok Stampers - the countdown is almost complete! In less than 8 hours, I'll be leaving for the airport to fly to Salt Lake City for our Stampin' Up! Convention! WooHoo!! To say that I am excited doesn't quite describe it! I have a big cardboard box of all my swaps - and a few gifts - going to the post office to be overnighted to our hotel; all the arrangements are in place for Emma and the doggies, now I guess I just need to pack my suitcase. Yes, you read that right - I have not packed even the first pair of underwear! And yet, here I sit, writing to you, stamping friends. Guess I'd better hurry up and get to it, eh? Well, let me at least do show and tell first! This was my card for the latest round of swapping with my GoDivas swap group. I put together this fantastic group of uber talented stampers and honestly, their work boggles my mind every time! I can't wait to see what they bring to Convention! For my card, I decided to create another Easel style. I used the NEW Calypso Coral InColor cardstock and made my easel pieces with the Top Note Die and the Big Shot. The background stamping was done with the NEW Delicate Doilies Stamp Set and I used Whisper White Craft Ink for them. The edges were sponged with Calypso Coral Classic Ink and I stamped my focal point piece with that as well. I added a bit of Poppy Parade Classic Ink to the stamp as well to give it a bit of a two tone look. The image is from the NEW Hostess Stamp Set, Posy Punch. 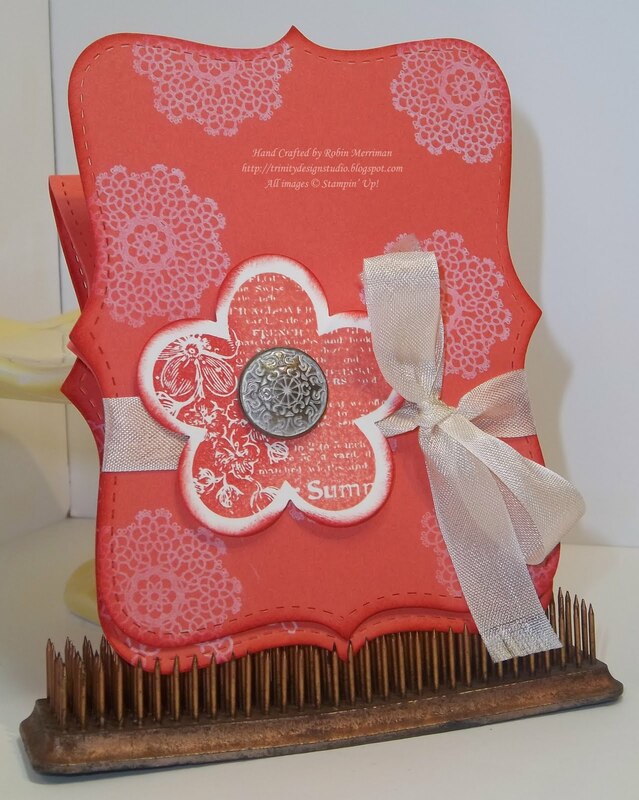 It has a great variety of images that coordinate with the Fancy Flower Punch and the 1" Circle Punch. Once the flowers were punched out, I sponged the edges with more Poppy Parade Classic Ink and then added an Antique Brad to the center. The ribbon bow tie is Very Vanilla Seam Binding - I just love the vintage look this ribbon gives to everything. For my "easel" piece, I used the greeting from Notably Ornate and stamped it with Calypso Coral Classic Ink on Very Vanilla Cardstock. It's punched out with the Modern Label Punch and sponged with more Calypso Coral. I popped it up on Stampin' Dimensionals, just like the flower on the front and that's it! All done! Now that all the GoDivas have received their swaps back in the mail, I thought it was safe to go ahead and share the card with you all - did ya like it? I hope so because it made me do the stampers happy dance when I finished it up! 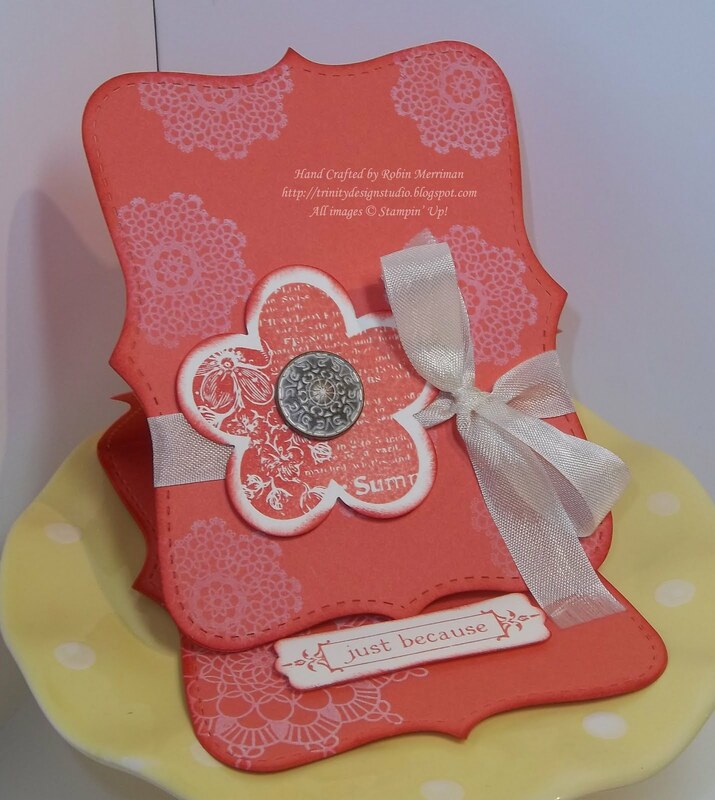 I'll still be posting while I'm at Convention - and be sure to "LIKE" the Stampin' Up! Facebook page if you haven't already! There are going to be some great things shared there through the week!